Aston Clinton gained a big three points at the weekend when they thrashed Grendon Rangers 5-1. 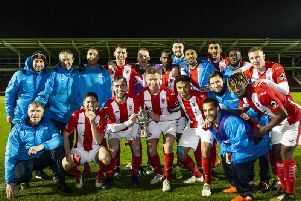 After starting on top, Aston took the lead through a debutant right-back Jake Page before Alex Smith slotted in a second goal 10 minutes later. Another surging forward run from Page saw him bag his second and Aston’s third, making it 3-0 at half-time, before Lamar Mason-Williams finished off good work from striker partner Lewis Workman. Grendon then pulled one back but Page snuffed out any chance of a comeback by completing his hat-trick. First team manager Jordan King said afterwards: “We were really impressive, the way we moved the ball and the tempo we done it at was incredible considering the state of the pitch. “Superb debut from all the new players especially Jack Page who looked a class act. “Our squad now is looking very strong which is keeping everyone on their toes.